Drop impact is a crucial step in many natural and industrial processes. The impact of raindrop is responsible for the aeration of lakes and the propagation of many forms of life, including fungi and bacteria. Impact is also determinant for spray coating, fuel injection, surface cooling, ink-jet printing and self-cleaning. 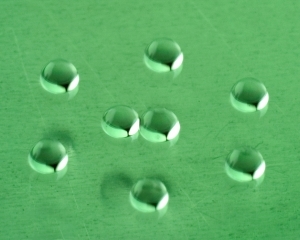 We here focus on the low-velocity impact of drops on a variety of liquid surfaces: pools, thin viscous layers and soap films. In each case, drops can either coalesce or bounce, remain in one piece or split into several droplets. As a drop approaches the other liquid body, air is expelled from the intervening air layer. The drop will bounce or coalesce according to whether this layer drains to a critical thickness during impact. This sustained air layer exerts a lubrication force that causes both the drop and the underlying liquid to deform. This stores surface energy in the same way as a spring. The drop then decelerates, and ultimately reverses direction when the surface energy is released. An oil drop impacts a thin viscous layer. It merges and splits into four droplets. Each of them then bounces several times. Only the drop (not the viscous layer) significantly deforms and stores energy. A drop can also bounce on a soap film, like a gymnast on a trampoline. Here, the soap film stores much more surface energy than the drop. Impacting a soap film: (Left) At low impact velocity, a drop of soapy water bounces on a soap film pinned on a circular ring. (Center) At high velocity, the drop crosses the soap film without breaking it. (Right) At intermediate velocity, the drop splits in two droplets. On a still liquid surface, the impact velocity decreases at each bounce, until the droplet settles onto and ultimately merges into the underlying liquid. To counter dissipative losses, a vertical vibration is applied: the droplet may then bounce indefinitely. 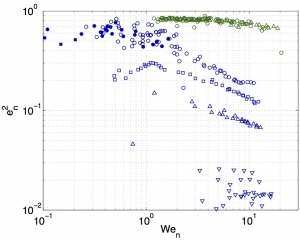 Periodic bouncing of droplets onto a vertically vibrated liquid. From left to right: (1) Simple rebound on a bath. (2) Self-propelled “roller” mode. (3) Emulsification through bouncing: oil droplets in water in oil. (4-6) Multistability: 3 drops bouncing differently on the same soap film. The strenght of a drop impact is characterized by the Weber number We = ρRV²/σ where ρ, σ, R and V are the density, surface tension, radius and impact velocity of the drop respectively. For example, the transition between bouncing on and crossing a soap film occurs at We=16. The Weber number is also related to the coefficient of restitution of the drop, namely the ratio of its velocity after and before impact. Normal (Left) and tangent (Right) coefficients of restitution, as functions of the normal Weber number. Blue = thin liquid film on solid, Green = soap film. Symbols refer to droplet viscosity. 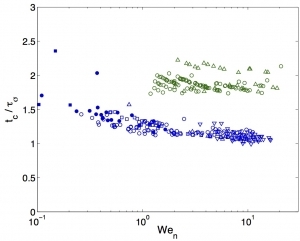 The normal coefficient decreases with increasing We and viscosity. 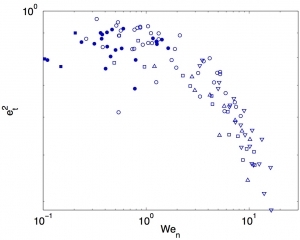 Surprisingly, the tangent coefficient of restitution does not depend on viscosity. Energy loss is much lower on a soap film. The time of apparent contact between the drop and the substrate is often measured in the literature. It is proportional to the capillary time and relatively independent on the Weber. Soap films produce larger contact times. Dimensionless contact time as a function of the Weber number. Blue = thin liquid film on solid. Green = soap film. In the case of periodic bouncing, a relevant parameter is Γ = Aω²/g where A and ω are the vibration amplitude and frequency respectively, and g is the gravity acceleration. There is a threshold value above which periodic bouncing can be observed. Many different bouncing modes are observed as Γ is increased. 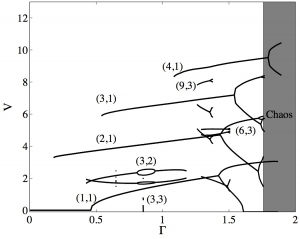 (Left) Dimensionless impact velocity of a droplet on a vibrated soap film, as a function of Γ. Multiple stable rebounds are possible for the same forcing parameters. (Right) Bouncing threshold as a function of forcing frequency. Extrema indicate resonance of drop deformations. 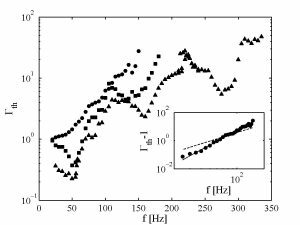 We have also investigated similar dynamical behaviors in theoretical models of periodic bouncing (partially elastic ball). The special case of a perfectly inelastic ball yields a very intriguing sensitivity to the forcing parameter Γ, reminiscent of structural chaos. Bouncing sequence of a perfectly inelastic ball on a vibrated surface.